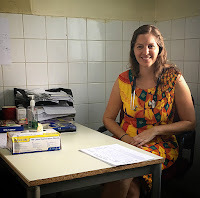 During the beginning of the Ebola outbreak, which was one of the most challenging times for me both personally and professionally, I embarked on a journey of gratitude. Everyday I paused, focused on the positive and wrote down one thing I was grateful for. I ended up with 365 moments of thankfulness. This journey helped me grow in gratitude and have a more positive outlook on life. At the start of 2019 I decided to continue this journey. Here’s week 1 of my moments of thankfulness! Day 7. Thankful that the National Emergency Medical Service (NEMS) is up & running and their ambulance was able to transfer two infants to the Children's hospital for us since our ambulance is temporarily out of service. Congratulations Mercy Ships! 40 years ago, on the 5th of October 1978, the first Mercy Ship was purchased. As a 1 year old at the time, I was oblivious that this ship would one day become my childhood home. However, just a year later, my family joined the M/V Anastasis in Greece and I had the privilege of spending the next 14 and a half years onboard. To date, the Anastasis is still the place I have lived the longest, surpassing The Netherlands. However, Sierra Leone is catching up with 13 and a half years and counting. I was the first child to go all the way from nursery through 12th grade onboard and although it wasn’t always easy, especially when I was the only child in my grade, I am so grateful that I grew up on the ship. What an amazing experience. From playing sticks, foursquare and sardines on the ship to swimming in the pool, playing basketball on the dock and roller-skating on the Aft deck. From sleeping outside during sails, watching dolphins swim alongside the ship, life boat drills and star gazing to having ‘fun nights’, ball room dancing, helping in the snack bar and watching movies in the lounge. I had the privilege of meeting so many people but also the heartache of constantly saying goodbye. The opportunity to visit over 40 countries was amazing, but also means some of my childhood memories are a bit of a blur in terms of where (in which country) a particular memory occurred. Being a part of community outreach including painting schools, building a playground, assisting in community clinics and spending time on the ward with patients coming for surgery, were defining moments. “I remember sitting down under the little palm-branch covered hut among the sick children and their hopeful moms. The sight of those children tugged at my heart. Holding a hopeless and suffering, measles inflicted child in my arms, after watching two other kids die from the same thing, made me realize how fortunate I really am. I also know that with God's strength I have something great that I can give to the dying children in the world today." I know this was very idealistic, but that experience along with the life changing surgeries I witnessed on the ship, inspired me to pursue medicine. I was exposed to people who genuinely cared about others and one of my life heroes is still onboard, extending compassion and humility to the patients that come his way. In just a few days Dr. Gary will meet 7 patients that I am sending from the clinic I work at in Freetown to the Africa Mercy in Conakry for cleft lip/palate surgery. It is an honour to help these children on their journey and to partner with Mercy Ships. 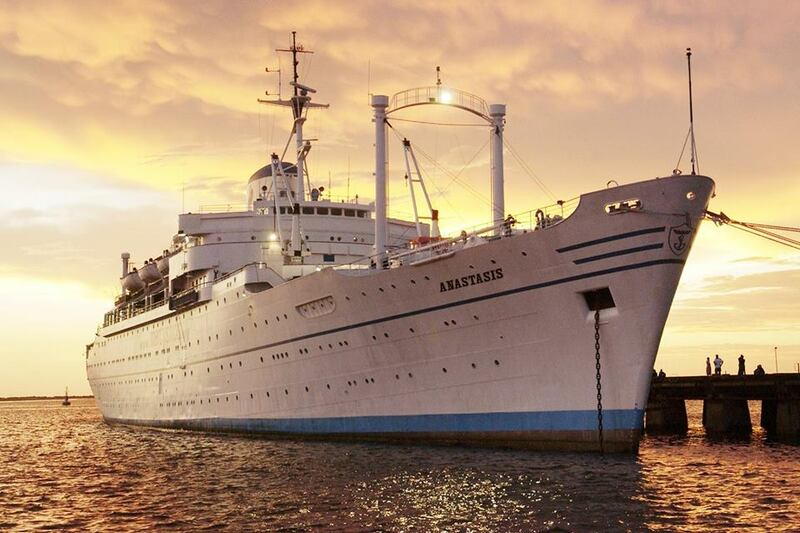 Although the M/V Anastasis was retired in 2007, the Africa Mercy and the Mercy Ships community still feel very much like home. Today marks the first day of another year at Aberdeen Women's Centre! Yesterday, I completed my first year working as a doctor in the outpatient paediatric clinic. 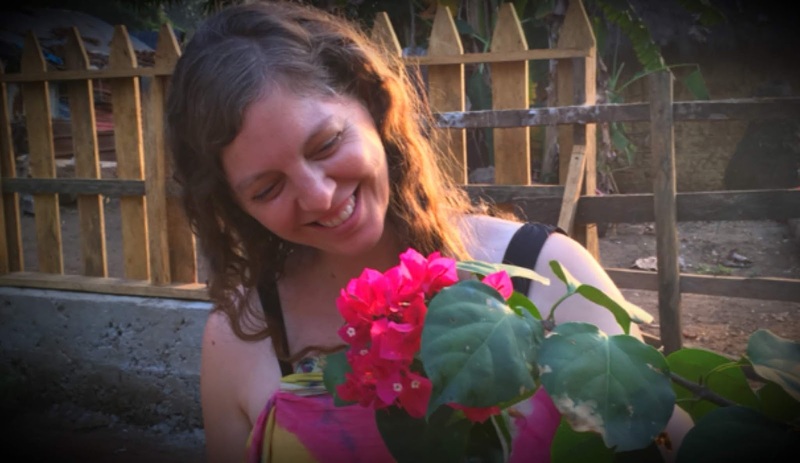 There was a lot of transition at the start, including a move to a new home, resuming clinical work and starting my online Masters in Public Health and at times I wondered if I would make it to the end of the contract. Thankfully, I did and I’ve decided to stay put for another year. Although there are parts of my work that are frustrating and challenging, like any job I suppose, the work I do in Aberdeen is also very rewarding. I have the unique opportunity to help children get better and advise and encourage the caregivers to provide healthier environments for their children, whether it’s through nutritional advice, encouraging them to bring their children for immunisations or teaching them how to prevent illness. 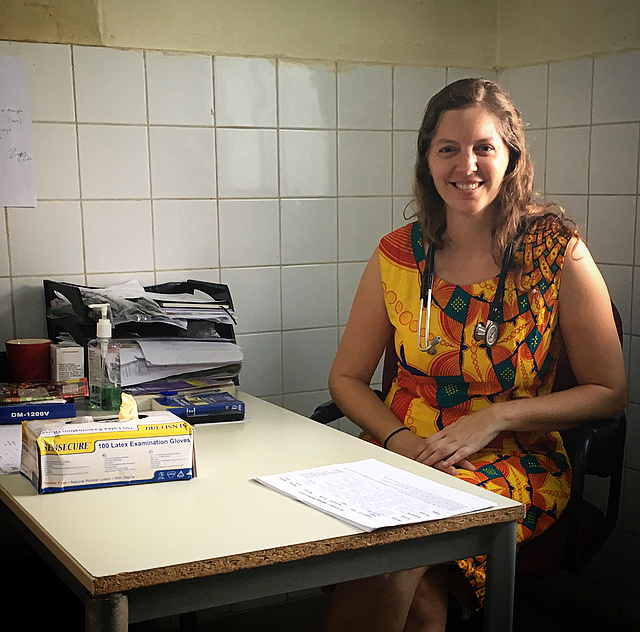 It’s a privilege to work alongside a Sierra Leonean team and provide healthcare that makes a difference in the lives of children and families in Freetown. Now that the rains have started, the clinic is even busier than usual and in the past three days alone we’ve treated over 400 patients. We are seeing more diarrheal disease, respiratory disease, as well as cases of severe malaria, in children of all ages. At times it’s scary to see just how sick these children can get but on the flip side, it is amazing to see how so many of them recover. I’m hoping for ongoing wisdom and energy for our team as we strive to help as many children as we can despite the craziness and long days. Here’s to another year at AWC. I arrived in Freetown last night after being away for a month. I had a great time on my three country trip but it was really good to come home! Besides the fact that the electricity cut out at around 3am meaning my fan switched off and it got pretty warm, I slept quite well. Thankfully the power came back and my fan cooled the room down again. Breakfast today consisted of tea with a Basha donut, courtesy of my housemate who was very considerate to buy some 'welcome back donuts' yesterday. There were about 45 patients waiting in the clinic when I arrived and they had probably been waiting since 5 or 6 am already. That’s the way it works here - no appointments and people come early to make sure they are seen that day. Thankfully clinic didn’t get too busy and we were able to take our time during the consultations. I even had time for lunch, which was rice with potato leaves - my favorite AWC meal. My first patient was an infant who needed to be referred due to severe pneumonia. I also saw a child with epilepsy, a 5 year old weighing 11 kilograms and a child who had been mismanaged at a pharmacy who I diagnosed with malaria and started on treatment. I saw others with acute respiratory tract infections, skin conditions like scabies and diarrhoeal disease. It’s definitely never dull! I even had a little time left over at the end of the afternoon to update one of our protocols. After work I found a taxi to take me to Aberdeen road junction, walked to a supermarket to pick up a few essential items and then walked home from there, ignoring quite a few “white girl” comments on the way. Another one of those things I have never gotten used to! I had a relaxing evening at home, which is a nice change since I usually come home and have to start studying right away. Thankfully module 3 of my MPH doesn’t start for another week. Alright, that’s it for a little glimpse of my first 24 hours back in Sierra Leone. More another day. It’s bed time now. As of tonight, Sierra Leone will have a new President, with the swearing in taking place any time now. Congratulations Julius Maada Bio. It was a 4 week process, but we finally have an outcome. The first round of elections between 16 Presidential candidates was held on the 7th of March, 2018. The results were announced on the 13th of March. 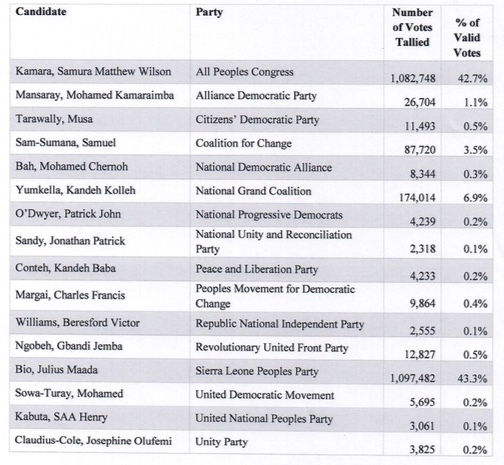 SLPP was in the lead with 43.3% of the votes, with APC closely behind with 42.7%. Since neither party had more than 55% or more, a run-off election was announced for the 27th March 2018. NGC had 6.9% of the votes and C4C 3.5%. The remaining 12 parties all had 1.1% or less. There was an 84% voter turnout. However, on the 26th March we awaited a decision by the High Court due to an interim injunction halting the runoff presidential election. Fortunately it was halted and the run-off election was allowed to go ahead, however, due to logistics that needed to be put in place, the run-off was postponed to Saturday 31 March, 2018. On Saturday 31 March, 2018, the run-off Presidential election was held. 2,578,271 people voted in 11,122 polling stations across the country, representing 81/11% of all registered voters. On Monday 2 April, 2018 the tallying was halted due to a disagreement between the parties on the process used. Later that day ballot counting and tallying continued with both parties having come to an agreement with the National Electoral Commission resolving the earlier dispute about which system to use. On 4 April, 2018, just after 10 pm, the National Electoral Commission announced that Bio Julius Made, having polled 51.81% of the valid votes cast on the 31st March 2018 Presidential election run-off, has been duly elected President of the Republic of Sierra Leone. There has been a lot of cheering, singing, whistle blowing, banging of pot covers tonight as many Sierra Leoneans are out in the streets celebrating. Let's hope for continued peace and for good conduct amongst people from various political parties. Hopefully everyone will graciously accept the election results. The people have spoken. Sierra Leone Election News. 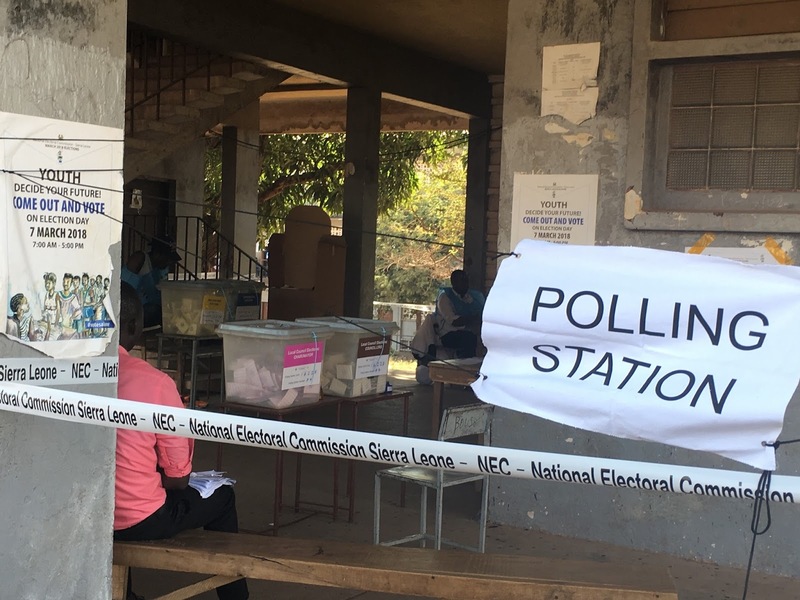 Freetown, Sierra Leone: The last 24 hours have been a little tense in Sierra Leone as we have been waiting for the results to be announced from the presidential election held on 7 March 2018. 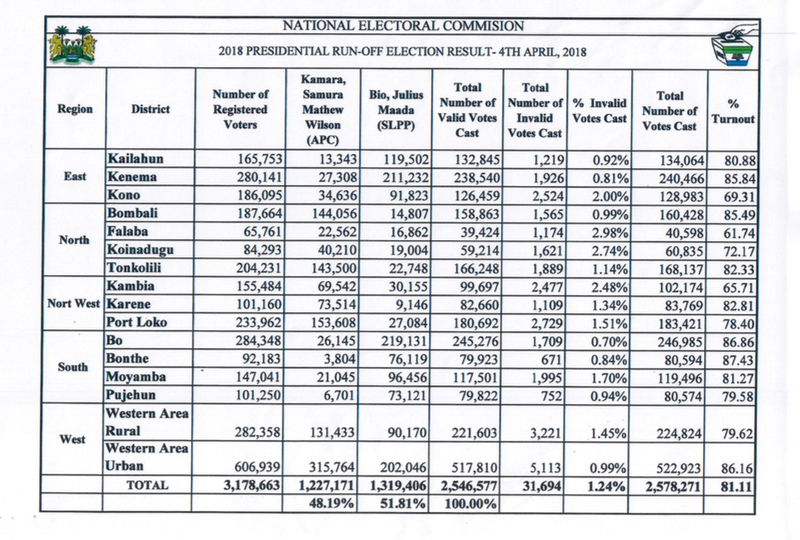 There was a lot of anticipation on the 12th of March 2018 with the hopes that the results would be announced by the National Electoral Commission (NEC). There were rumors that they would communicate at 14:00 hrs, then 16:00 hrs, then 19:00 hrs. However, the announcement did not take place and instead we were informed that ballot papers were going to be recounted at 72 polling stations in various districts. This was in addition to recounts in 82 polling stations, announced the previous day. These recounts were being conducted after deliberations with political parties. During the day on the 13th of March there were more rumours that the results would be announced. Finally at 16:30 hours, NEC announced that there would be a briefing held at a press conference at 19:00 hrs today. At 19:00 hrs today thousands of people in Sierra Leone were tuned in to their radios, waiting in suspense for NEC's announcement. 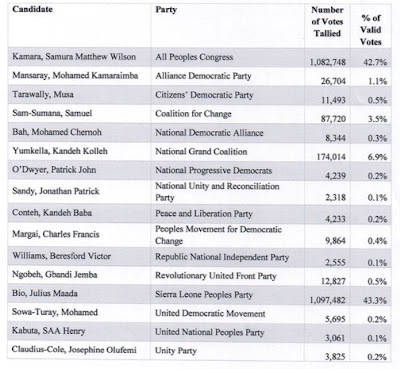 Finally, at 19:46 hrs, NEC announced the election results for the presidential election with the opposition party, SLPP, leading with 43.3% of the votes and the ruling party, APC, closely behind with 42.7%. Since neither party has 55% or more of the votes, a run-off election will be held on 27 March 2018, two weeks from today. NGC has 6.9% of the votes, C4C 3.5% and the remaining 12 parties all have 1.1% or less. NEC reports that the results from 221 polling stations were excluded, including stations where votes cast exceeded the number of registered voters at those stations. Also, after deliberations with political parties, recounts were conducted in 154 polling stations, none of these results were nullified. 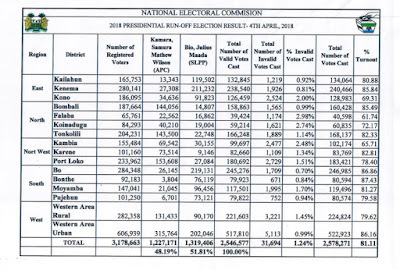 There were 3,178,663 people registered to vote, of which 2,676,549 people voted (with 139,427 invalid votes), meaning there was a 84.2% voter turnout on 7 March 2018. Well done Sierra Leone for conducting a credible election. Let's continue to keep the peace in the lead up to the run-off and the transition of power to whoever is elected as the next President of Sierra Leone. Today on International Women’s Day I want to be a voice for the many girls, who are yet to become women; those who have already experienced pregnancy. Sierra Leone has the 7th highest adolescent pregnancy rate in the world, with 38% of women aged 20-24 giving birth by the age of 18. This has significant consequences for their own health and that of their baby, as well as vast socioeconomic impact. Children bearing children. This is wrong. Sierra Leone has some of the highest maternal, infant and child mortality rates in the world and 40% of maternal deaths are as a result of adolescent pregnancy. Infants born to teenage mothers are at higher risk, with stillbirths and deaths in the first week of life being 50% higher, compared with babies born to 20-29 year olds. 46% of adolescents with no education become pregnant, compared to 22% with secondary education or higher. The third most common cause for school dropout among girls is pregnancy. Education is crucial. For every year a girl remains in primary school her income increases by 10-20% with an extra year of secondary school increasing earnings by 15-25%. These wages are likely to be reinvested into their families, creating better opportunities for their children. Every year of secondary school may reduce child marriage by 5% and for each additional year of girl education, child mortality decreased by 9.5%. There are many health and gender inequalities that contribute to adolescent pregnancy: poverty, lack of education, gendered social norms, child marriage, traditional practices, and the list goes on. Girls in other countries face similar risks. What is being done about this? Can we do more? As we stand up for women today, let us also stand up for girls. Let’s educate them and empower them. Let’s provide the needed health and social services for them. Let’s enforce legislation that protects them. As the government in Sierra Leone states: “Let girls be girls, not mothers”. Let’s work together to make this happen. Whether you are a government official, or a teacher, or a nurse, or a social worker, or a stay at home mother, or an aunty, or a grandmother, let’s all play our part. Change policies, provide better services, be a positive role model. Encourage. Empower. Educate. 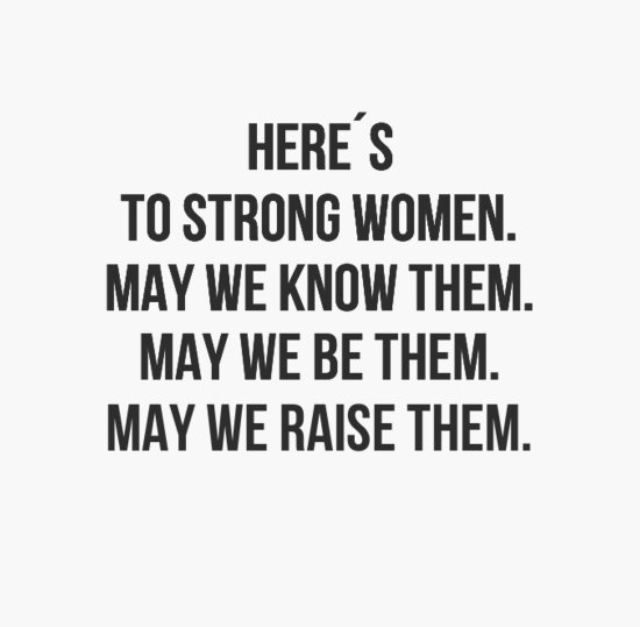 For the girls you have the privilege to interact with, invest in them and raise them up to be strong women. Note: Data in this post is taken from my end of module project for my Masters in Public Health submitted 28 February 2018. Today was a big day in Sierra Leone as voters went to cast their votes at the polling stations. Across the country 11,000 polling stations were open for voting between 7 am and 5 pm and according to the National Electoral Commission, 3,178,663 people were registered to vote. At some polling stations, people starting lining up at 2 am, at others it was later, but by 7 am, most of the stations were open to voters. The voters were each given 4 ballots to vote for Presidential, Parliamentary, Local Council and Mayoral candidates. Once the ballots were marked, they were immediately deposited into the designated ballot boxes. After polling stations closed at 5pm, the manual counting of the votes began. The day was peaceful and there was a great atmosphere in the air. I was able to visit two polling centres and it was great to sense the excitement. From what I could see, and from what I’ve read, NEC organised the election extremely well, and in most polling stations, it has been reported that voting was carried out well. It wasn’t until after 5pm that there was some commotion reported in a few different areas in Freetown. Apparently the police searched the premises of the main opposition leader, where he and his team were monitoring the elections, on allegations that they were hacking results. This intrusion led to commotion. Thankfully the former Ghanaian President, also head of the Commonwealth election observer mission, diffused the situation. It is of note that counting of votes is all done manually. A time of waiting and anticipation has begun and many people will be listening to their radios over the coming days while the counting continues. NEC will announce initial results once 25% of the votes have been counted and verified. Let’s wait patiently and peacefully. Amazing patriotism was shown today. Please continue to make Sierra Leone proud. Stand United.